Over time, tooth enamel loses its luster due to years of daily use. Coffee, tobacco and numerous other lifestyle factors contribute to the gradual dulling and discoloration of your smile. ZOOM! 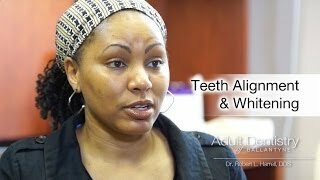 Whitening is the perfect vehicle for reversing this process. It can brighten teeth by as much as seven shades in a single treatment. Best of all, the process is safe, painless and fast. In fact, a full treatment is completed in one office visit lasting about an hour. Before ZOOM! treatment begins, a special preparation is applied to the gums so only the surface of the teeth are subject to the whitening process. The teeth are then coated with the actual whitening gel. 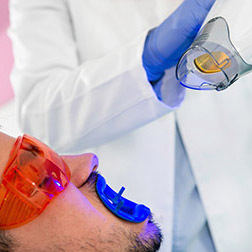 Next, ultraviolet (UVA) light is directed onto the surface of the teeth, activating the whitening properties in the gel. Together, the light and the gel penetrate the enamel and dissolve years of stains and discoloration. If you’re ready for a brilliant new smile, call Adult Dentistry of Ballantyne at (704) 541-9888 or use the contact form below to schedule your ZOOM! whitening appointment. We look forward to hearing from you. This popular cosmetic procedure is regularly priced at $625. Make your appointment today and take advantage of these special savings.